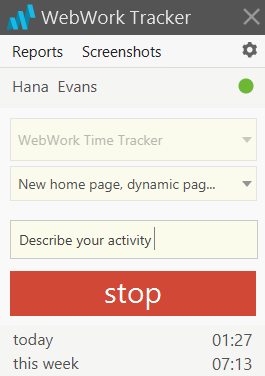 WebWork Time Tracker desktop application tracks your working time, records activity level, captures screenshots of your screen (optional). 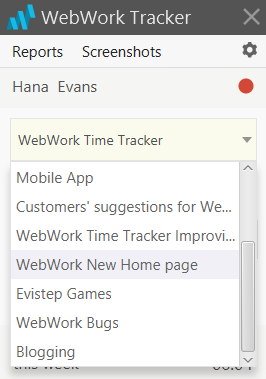 What does the WebWork Time Tracker do? Tracker counts the mouse clicks and keyboard strokes. Takes Screenshots (considering the Screenshot mode). Records active applications and browser windows. You need to select a project in order to track time. You need to have projects and assigned contracts in your web account in order to see the projects in your desktop tracker. 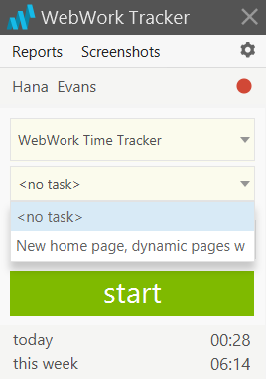 You can track time on your Tasks as well or you can leave the Task field with "no task" selected. You need to select a project and to be assigned on the particular task in order to track time on that task. To have more information in your reports later, describe your activity. You can type random texts here and change it while the tracker is on. This could help in generating detailed invoices. 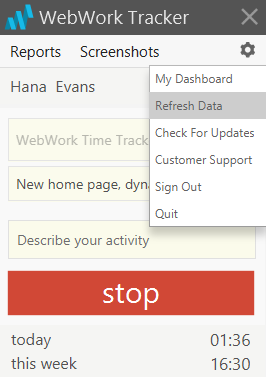 You can go directly to your Report and Screenshot Pages from your time tracker.